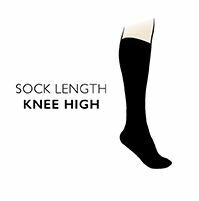 Worn high or slouched low on the legs, ToeSox Scrunch Half Toe Organic Cotton Fishnet Knee High Socks keep your muscles warm and ready to perform, whether your passion is for Pilates, yoga, dance, barre, martial arts or any other traditionally barefoot activity – and there’s the difference. ToeSox give you the hygienic alternative to bare feet, with a patented non-slip grip to help keep your feet in place. The separate open toes give you all the feel and grip you’re used to with bare feet, but better, with fitted heels, ankle bands and arch support bands to gently lift and support you at the mid-foot. ToeSox Scrunch Half Toe Organic Cotton Fishnet Knee High Socks have a soft pointelle weave in a pretty diamond pattern.